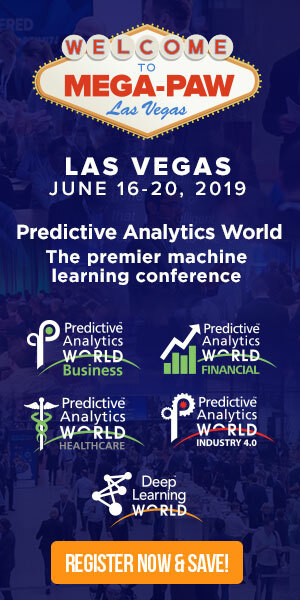 In anticipation of his upcoming conference presentation at Predictive Analytics World for Healthcare Boston, Sept 27-Oct 1, 2015, we asked Scott Jelinksy, Principal Research Scientist at Pfizer, Inc., a few questions about incorporating predictive analytics into healthcare. Catch a glimpse of his presentation, Crowdsourcing Predictive Analytics to Enhance Clinical Trial Design, and see what’s in store for the second annual PAW Healthcare conference in Boston. A: We use predictive analytics to support a variety of different areas of health care, but our primary interest is to help support precision medicine to be sure that the right patients get the right drugs. A: We use a combination of health care records and baseline clinical data to be able to predict which patients would most likely have a positive response to therapy and to identify those patients that are at a higher risk for potential adverse side effects. A: By improving the understanding of the risk/benefit ratio we strive to decrease the risk of the product and improve patient safety profile. Our work has positively impacted the clinical trial design by being able to enrich for patients that are more likely to benefit from treatment. A: Using predictive analytics, thus far we have seen approximately 20% improvement of predictability (e.g. patients more likely to have worsening of symptoms) over baseline model used prior. A: There are many surprises using advanced predictive analytics. The most encouraging was that the predictive ability achieved was much greater than what we initially thought possible. More specifically, the number of individual features that contribute makes for a much more advanced algorithm. Q: What area of healthcare do you think have seen the greatest advances or ROI from the use of predictive analytics? A: The greatest advances using predictive analytics is the ability to collect and decipher large scale genetic data as it applies to individual clinical presentations and outcomes. A: I will describe how distributed innovation and crowdsourcing can be an effective tool in developing predictive analytics to improve and fine tune algorithms. Don’t miss Scott’s presentation, Crowdsourcing Predictive Analytics to Enhance Clinical Trial Design, at PAW Healthcare on Monday, September 28, 2015 from 4:45 to 5:30 pm. Click here to register for attendance.